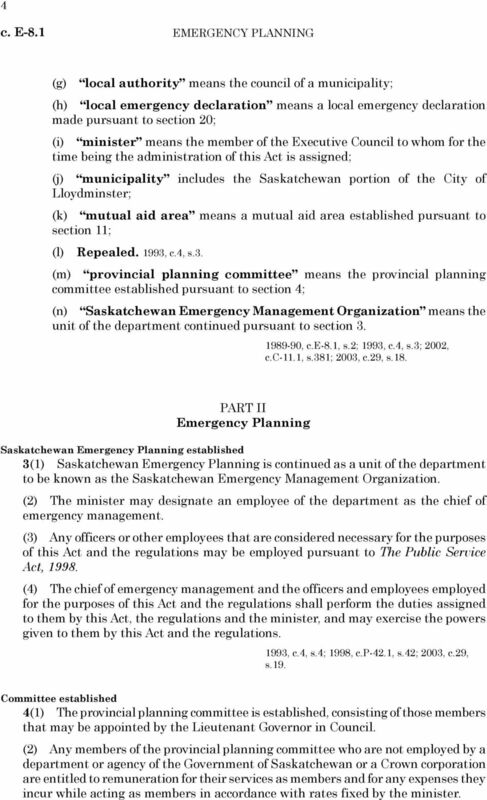 Download "The Emergency Planning Act"
1 1 EMERGENCY PLANNING c. E-8.1 The Emergency Planning Act being Chapter E-8.1 of the Statutes of Saskatchewan, (effective November 1, 1989) as amended by the Statutes of Saskatchewan, 1992, c.a-24.1; 1993, c.4; 1998, c.p-42.1; 2002, c.c-11.1; 2003, c.29; and 2013, c.r NOTE: This consolidation is not official. Amendments have been incorporated for convenience of reference and the original statutes and regulations should be consulted for all purposes of interpretation and application of the law. In order to preserve the integrity of the original statutes and regulations, errors that may have appeared are reproduced in this consolidation. 3 3 EMERGENCY PLANNING c. E-8.1 CHAPTER E-8.1 An Act respecting Emergencies PART I Title and Interpretation Short title 1 This Act may be cited as The Emergency Planning Act. Interpretation 2 In this Act: (a) chief of emergency management means the chief of emergency management designated pursuant to section 3; (a.1) district committee means the district committee of an emergency planning district required pursuant to subsection 7(1); (a.2) department means the department over which the minister presides; (b) emergency means: (i) a calamity caused by: (A) accident; (B) act of war or insurrection; (C) terrorist activity as defined in the Criminal Code; (D) forces of nature; or (ii) a present or imminent situation or condition, including a threat of terrorist activity as defined in the Criminal Code, that requires prompt action to prevent or limit: (A) the loss of life; (B) harm or damage to the safety, health or welfare of people; or (C) damage to property or the environment; (c) emergency declaration means an order of the Lieutenant Governor in Council made pursuant to subsection 17(1); (d) emergency planning district means an emergency planning district established pursuant to section 6; (e) Repealed. 1993, c.4, s.3. (f) Repealed. 1993, c.4, s.3. 4 4 c. E-8.1 EMERGENCY PLANNING (g) local authority means the council of a municipality; (h) local emergency declaration means a local emergency declaration made pursuant to section 20; (i) minister means the member of the Executive Council to whom for the time being the administration of this Act is assigned; (j) municipality includes the Saskatchewan portion of the City of Lloydminster; (k) mutual aid area means a mutual aid area established pursuant to section 11; (l) Repealed. 1993, c.4, s.3. (m) provincial planning committee means the provincial planning committee established pursuant to section 4; (n) Saskatchewan Emergency Management Organization means the unit of the department continued pursuant to section , c.e-8.1, s.2; 1993, c.4, s.3; 2002, c.c 11.1, s.381; 2003, c.29, s.18. PART II Emergency Planning Saskatchewan Emergency Planning established 3(1) Saskatchewan Emergency Planning is continued as a unit of the department to be known as the Saskatchewan Emergency Management Organization. (2) The minister may designate an employee of the department as the chief of emergency management. (3) Any officers or other employees that are considered necessary for the purposes of this Act and the regulations may be employed pursuant to The Public Service Act, (4) The chief of emergency management and the officers and employees employed for the purposes of this Act and the regulations shall perform the duties assigned to them by this Act, the regulations and the minister, and may exercise the powers given to them by this Act and the regulations. 1993, c.4, s.4; 1998, c.p-42.1, s.42; 2003, c.29, s.19. Committee established 4(1) The provincial planning committee is established, consisting of those members that may be appointed by the Lieutenant Governor in Council. (2) Any members of the provincial planning committee who are not employed by a department or agency of the Government of Saskatchewan or a Crown corporation are entitled to remuneration for their services as members and for any expenses they incur while acting as members in accordance with rates fixed by the minister. 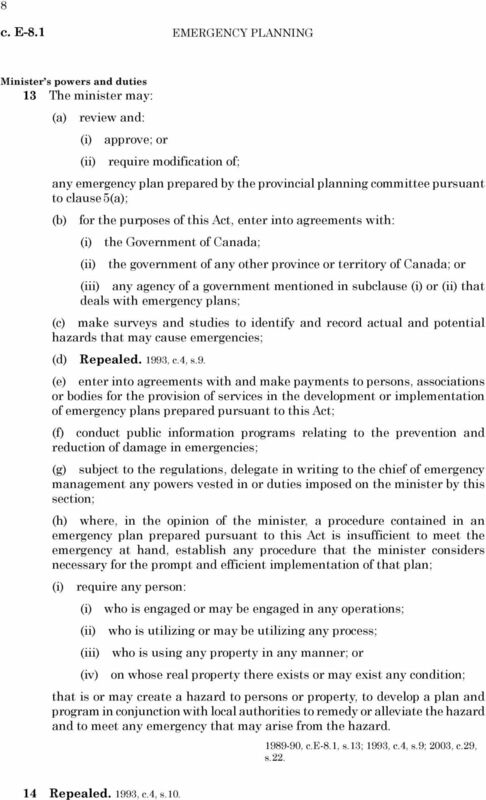 5 5 EMERGENCY PLANNING c. E-8.1 (3) The chief of emergency management is the chairperson of the provincial planning committee. (4) If the chief of emergency management is absent or unable to perform the duties of the chairperson for any reason, the minister may appoint another person to act as chairperson in the place of the chief of emergency management until the chief of emergency management returns or is able to perform the duties of chairperson, as the case may be , c.e-8.1, s.4; 1993, s.4, s.5; 2003, c.29, s.20. Duties of committee 5 The provincial planning committee shall: (a) prepare an emergency plan for Saskatchewan, for approval by the minister, governing: (i) the provision of necessary services during an emergency; and (ii) the procedures under and the manner in which persons will respond to an emergency; and (b) advise the minister respecting emergency planning matters , c.e-8.1, s.4. Emergency planning districts 6(1) The Lieutenant Governor in Council may establish, by order, emergency planning districts for the purpose of organizing intermunicipal emergency planning, training, assistance and emergency operations programs. 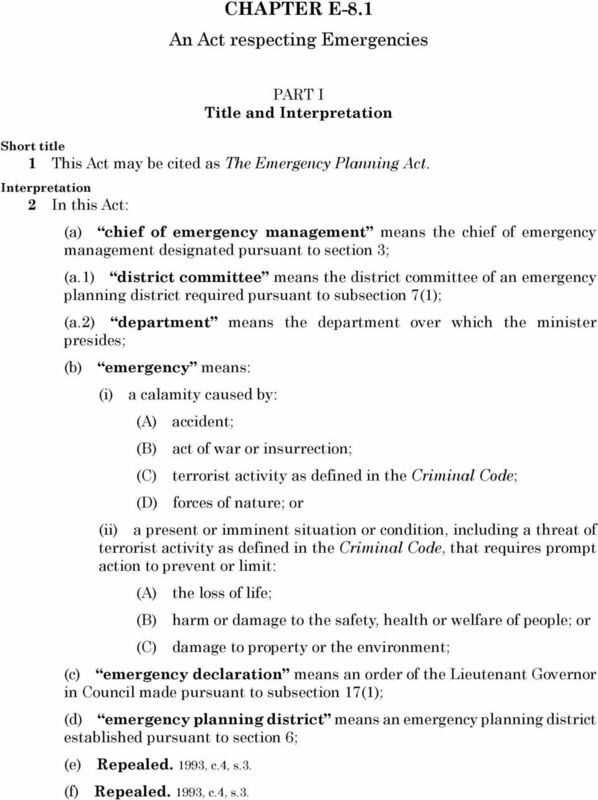 (2) The Lieutenant Governor in Council, by order, may: (a) amend the boundaries of any emergency planning district; (b) establish new emergency planning districts; or (c) do both of the things mentioned in clauses (a) and (b) , c.e-8.1, s.6. 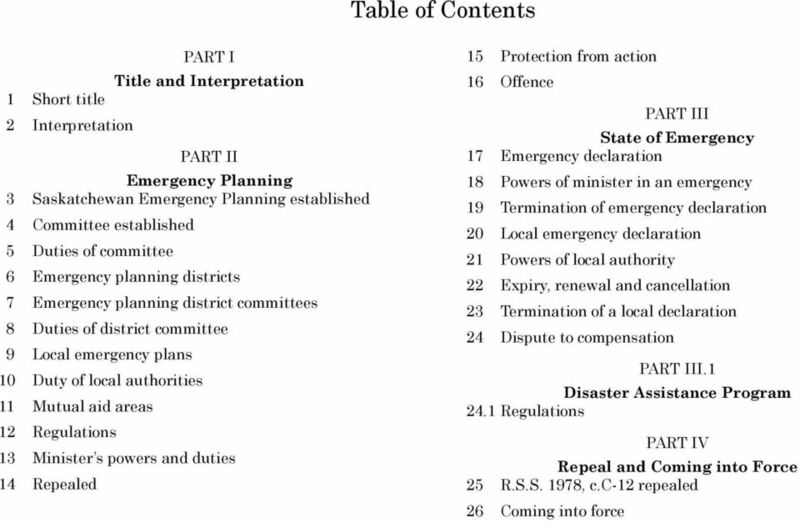 Emergency planning district committees 7(1) Every emergency planning district shall have a district committee composed of: (a) those persons appointed by local authorities pursuant to subsection (2); and (b) those persons appointed pursuant to subsection (3). (2) Every local authority of a municipality located within an emergency planning district shall appoint a representative to be a member of the district committee. 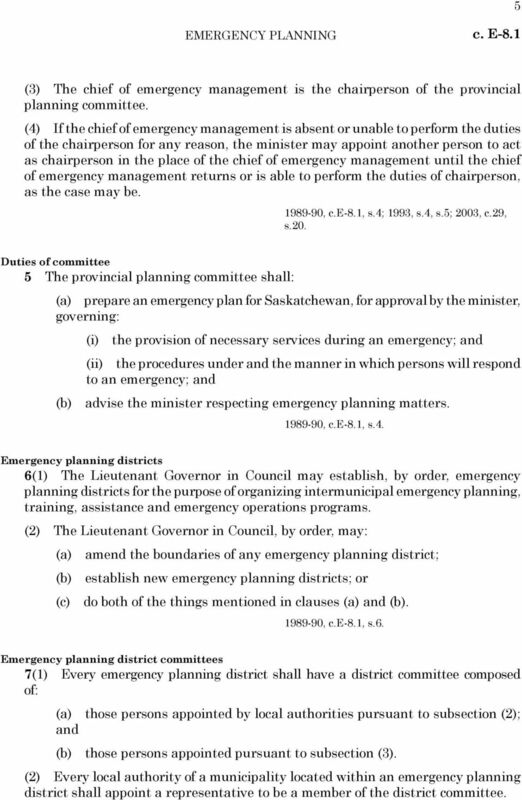 6 6 c. E-8.1 EMERGENCY PLANNING (3) Every: (a) department and agency of the Government of Saskatchewan; and (b) every Crown corporation; that is designated by the Lieutenant Governor in Council shall appoint a representative to be a member of the district committee. (4) The chief of emergency management, or any member of the district committee designated by the chief of emergency planning, is the chairperson of the district committee , c.e-8.1, s.7; 1993, c.4, s.6; 2003, c.29, s.21. Duties of district committee 8 Every district committee, with the consent of the local authorities, may assist in the formulation of the emergency plans of the local authorities of municipalities situated within the emergency planning district , c.e-8.1, s.8. Local emergency plans 9(1) Every local authority shall: (a) establish a local emergency measures organization; (b) appoint a person as a local emergency measures co-ordinator; and (c) establish a local emergency planning committee composed of: (i) the emergency measures co-ordinator appointed pursuant to clause (b); and (ii) any other persons the local authority considers necessary. (2) The emergency measures co-ordinator is the chairperson of the local emergency planning committee. 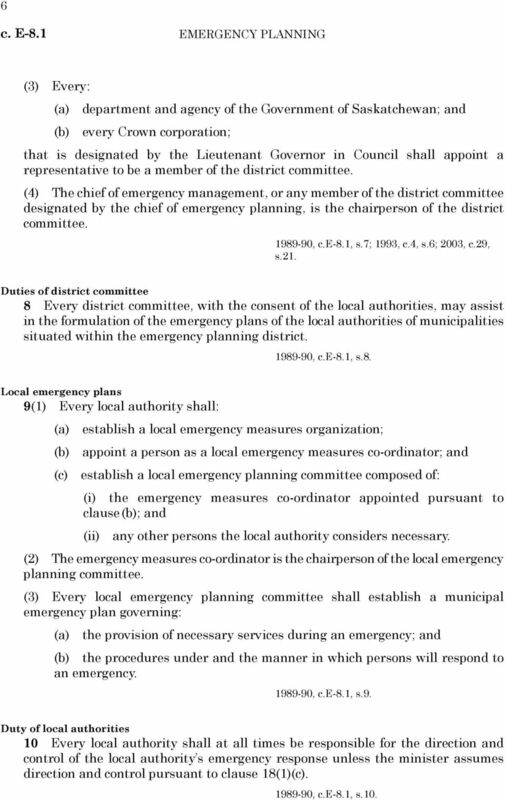 (3) Every local emergency planning committee shall establish a municipal emergency plan governing: (a) the provision of necessary services during an emergency; and (b) the procedures under and the manner in which persons will respond to an emergency , c.e-8.1, s.9. Duty of local authorities 10 Every local authority shall at all times be responsible for the direction and control of the local authority s emergency response unless the minister assumes direction and control pursuant to clause 18(1)(c) , c.e-8.1, s.10. 7 7 EMERGENCY PLANNING c. E-8.1 Mutual aid areas 11(1) In this section: (a) regional park means a regional park established or continued pursuant to The Regional Parks Act, 2013; (b) regional park authority means a regional park authority constituted or continued pursuant to The Regional Parks Act, (2) For the purposes of establishing a mutual aid area, a local authority may enter into agreements with all or any of the following: (a) other local authorities; (b) regional park authorities; (c) the member of the Executive Council responsible for the administration of The Parks Act. (3) The purpose of establishing a mutual aid area is to pool the resources of local authorities, regional park authorities and the Crown in right of Saskatchewan in order to improve their emergency response capabilities with respect to regional parks, provincial parks designated pursuant to The Parks Act and municipalities located within the mutual aid area. 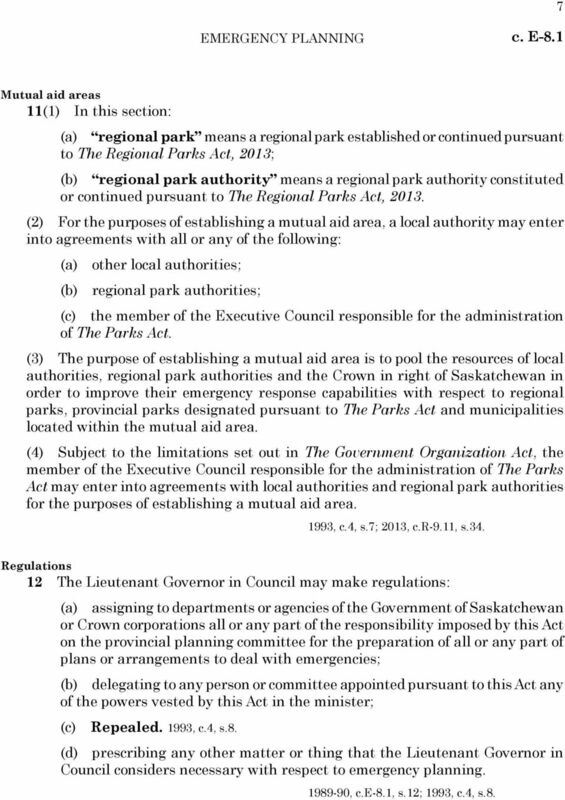 (4) Subject to the limitations set out in The Government Organization Act, the member of the Executive Council responsible for the administration of The Parks Act may enter into agreements with local authorities and regional park authorities for the purposes of establishing a mutual aid area. 1993, c.4, s.7; 2013, c.r-9.11, s.34. Regulations 12 The Lieutenant Governor in Council may make regulations: (a) assigning to departments or agencies of the Government of Saskatchewan or Crown corporations all or any part of the responsibility imposed by this Act on the provincial planning committee for the preparation of all or any part of plans or arrangements to deal with emergencies; (b) delegating to any person or committee appointed pursuant to this Act any of the powers vested by this Act in the minister; (c) Repealed. 1993, c.4, s.8. (d) prescribing any other matter or thing that the Lieutenant Governor in Council considers necessary with respect to emergency planning , c.e-8.1, s.12; 1993, c.4, s.8. 8 8 c. E-8.1 EMERGENCY PLANNING Minister s powers and duties 13 The minister may: (a) review and: (i) approve; or (ii) require modification of; any emergency plan prepared by the provincial planning committee pursuant to clause 5(a); (b) for the purposes of this Act, enter into agreements with: (i) the Government of Canada; (ii) the government of any other province or territory of Canada; or (iii) any agency of a government mentioned in subclause (i) or (ii) that deals with emergency plans; (c) make surveys and studies to identify and record actual and potential hazards that may cause emergencies; (d) Repealed. 1993, c.4, s.9. (e) enter into agreements with and make payments to persons, associations or bodies for the provision of services in the development or implementation of emergency plans prepared pursuant to this Act; (f) conduct public information programs relating to the prevention and reduction of damage in emergencies; (g) subject to the regulations, delegate in writing to the chief of emergency management any powers vested in or duties imposed on the minister by this section; (h) where, in the opinion of the minister, a procedure contained in an emergency plan prepared pursuant to this Act is insufficient to meet the emergency at hand, establish any procedure that the minister considers necessary for the prompt and efficient implementation of that plan; (i) require any person: (i) who is engaged or may be engaged in any operations; (ii) who is utilizing or may be utilizing any process; (iii) who is using any property in any manner; or (iv) on whose real property there exists or may exist any condition; that is or may create a hazard to persons or property, to develop a plan and program in conjunction with local authorities to remedy or alleviate the hazard and to meet any emergency that may arise from the hazard , c.e-8.1, s.13; 1993, c.4, s.9; 2003, c.29, s Repealed. 1993, c.4, s.10. 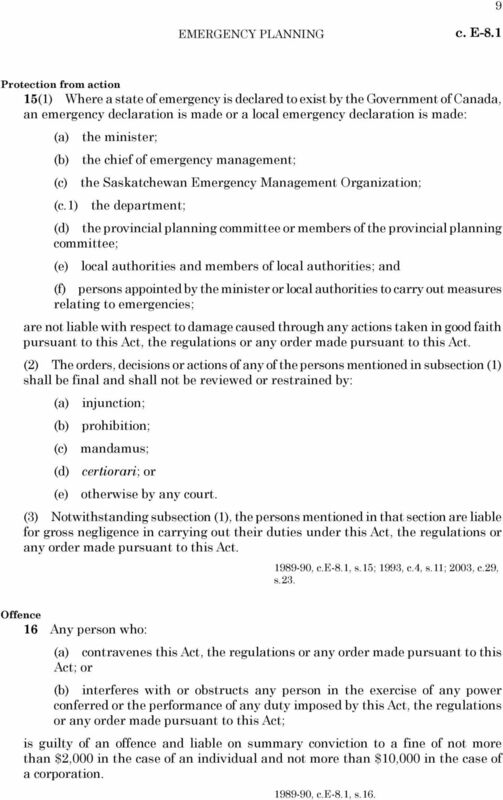 9 9 EMERGENCY PLANNING c. E-8.1 Protection from action 15(1) Where a state of emergency is declared to exist by the Government of Canada, an emergency declaration is made or a local emergency declaration is made: (a) the minister; (b) the chief of emergency management; (c) the Saskatchewan Emergency Management Organization; (c.1) the department; (d) the provincial planning committee or members of the provincial planning committee; (e) local authorities and members of local authorities; and (f) persons appointed by the minister or local authorities to carry out measures relating to emergencies; are not liable with respect to damage caused through any actions taken in good faith pursuant to this Act, the regulations or any order made pursuant to this Act. (2) The orders, decisions or actions of any of the persons mentioned in subsection (1) shall be final and shall not be reviewed or restrained by: (a) injunction; (b) prohibition; (c) mandamus; (d) certiorari; or (e) otherwise by any court. (3) Notwithstanding subsection (1), the persons mentioned in that section are liable for gross negligence in carrying out their duties under this Act, the regulations or any order made pursuant to this Act , c.e-8.1, s.15; 1993, c.4, s.11; 2003, c.29, s.23. Offence 16 Any person who: (a) contravenes this Act, the regulations or any order made pursuant to this Act; or (b) interferes with or obstructs any person in the exercise of any power conferred or the performance of any duty imposed by this Act, the regulations or any order made pursuant to this Act; is guilty of an offence and liable on summary conviction to a fine of not more than $2,000 in the case of an individual and not more than $10,000 in the case of a corporation , c.e-8.1, s.16. 11 11 EMERGENCY PLANNING c. E-8.1 (h) provide, maintain and co-ordinate emergency medical, welfare and other essential services in any part of Saskatchewan; (i) cause the evacuation of persons and the removal of persons or live stock and personal property from any area of Saskatchewan that is or may be affected by an emergency and make arrangements for the adequate care and protection of those persons or live stock and of the personal property; (j) authorize the entry into any building or on any land, without warrant, by any person in the course of implementing an emergency plan; (k) cause the demolition or removal of any trees, structures or crops if the demolition or removal is necessary or appropriate in order to reach the scene of the emergency, to attempt to forestall its occurrence or to combat its progress; (l) procure or fix prices for food, clothing, fuel, equipment, medical supplies or other essential supplies and the use of any property, services, resources or equipment within any part of Saskatchewan for the duration of the state of emergency; (m) conscript persons needed to meet an emergency; and (n) do all acts and take all proceedings that are reasonably necessary to meet the emergency. 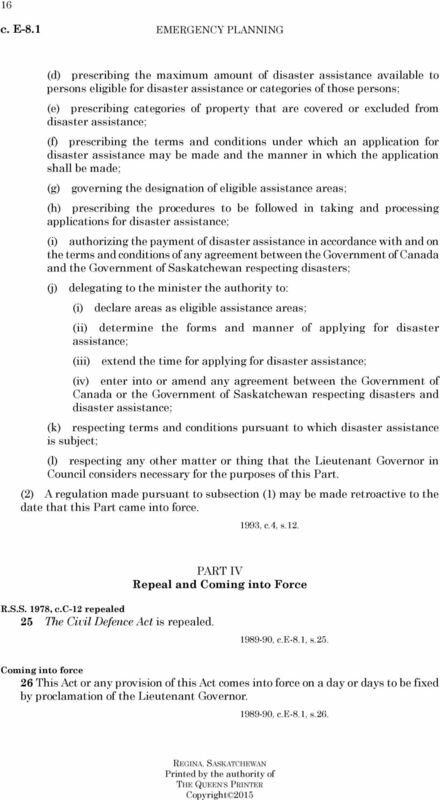 (2) Subject to the approval of the Lieutenant Governor in Council, where: (a) the minister acquires or utilizes real or personal property pursuant to subsection (1); or (b) any real or personal property is damaged or destroyed due to an action of the minister in preventing, combating or alleviating the effects of an emergency; the minister shall cause compensation to be paid for the acquisition, utilization, damage or destruction. (3) The Lieutenant Governor in Council may make regulations prescribing any matter the Lieutenant Governor in Council considers necessary to carry out any of the matters mentioned in subsection (1). (4) On the making of an emergency declaration all persons and agencies involved in the implementation of emergency plans shall comply with any directions of the minister , c.e-8.1, s.18. 12 12 c. E-8.1 EMERGENCY PLANNING Termination of emergency declaration 19(1) When, in the opinion of the Lieutenant Governor in Council: (a) an emergency no longer exists in an area with respect to which an emergency declaration was made; or (b) it is in the public interest that an emergency declaration be terminated in an area with respect to which an emergency declaration was made; the Lieutenant Governor in Council shall make an order terminating the emergency declaration with respect to that area. (2) Immediately after: (a) an order is made pursuant to subsection (1); or (b) the emergency declaration expires pursuant to subsection 17(4); the minister shall cause the details of the termination or expiry, as the case may be, to be published by any means of communication that the minister considers is most likely to make those details known to the majority of the population of the area affected by the contents of the order or expiry, as the case may be , c.e-8.1, s.19. Local emergency declaration 20(1) At any time when a local authority is satisfied that an emergency exists or may exist, in all or any part of the municipality, it may by resolution make a local emergency declaration relating to all or any part of the municipality. 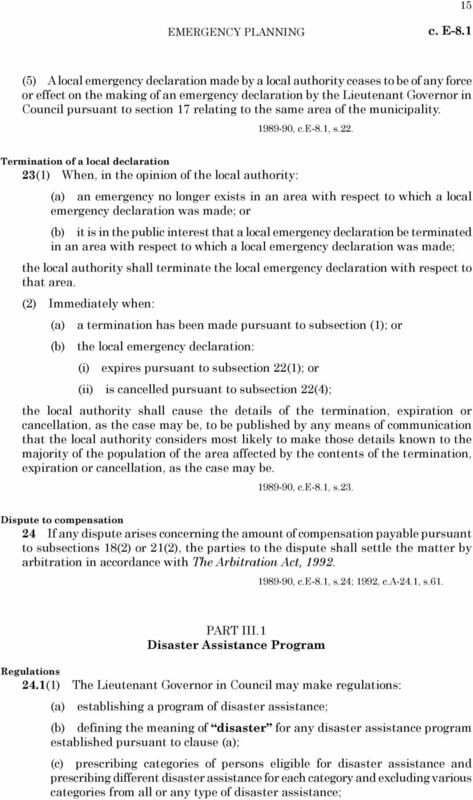 (2) Where: (a) it is not possible to assemble a sufficient number of members of a local authority to pass a resolution pursuant to subsection (1); and (b) a member of the local authority reasonably believes that: (i) a local emergency exists; and (ii) the emergency requires immediate action; a member of the local authority may make a local emergency declaration on behalf of the local authority. 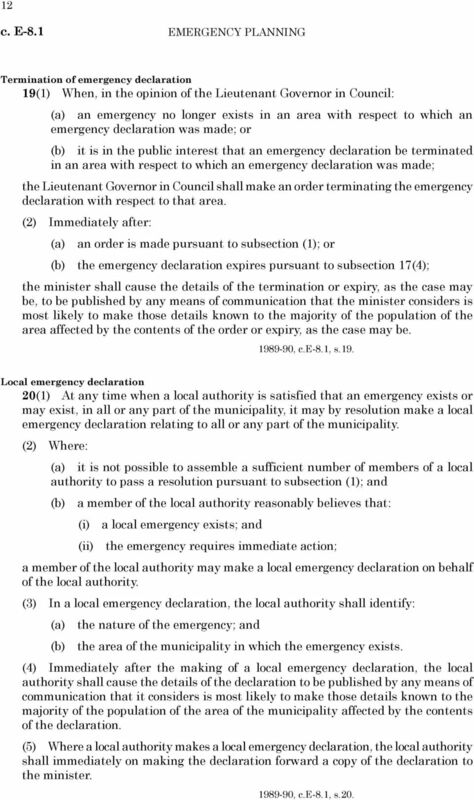 (3) In a local emergency declaration, the local authority shall identify: (a) the nature of the emergency; and (b) the area of the municipality in which the emergency exists. (4) Immediately after the making of a local emergency declaration, the local authority shall cause the details of the declaration to be published by any means of communication that it considers is most likely to make those details known to the majority of the population of the area of the municipality affected by the contents of the declaration. (5) Where a local authority makes a local emergency declaration, the local authority shall immediately on making the declaration forward a copy of the declaration to the minister , c.e-8.1, s.20. 13 13 EMERGENCY PLANNING c. E-8.1 Powers of local authority 21(1) On the making: (a) of a local emergency declaration, or a renewal of a local emergency declaration pursuant to subsection 22(2) and for the duration of the state of emergency the local authority may: (i) put into operation any emergency plan or program that the local authority considers appropriate; (ii) acquire or utilize any real or personal property that the local authority considers necessary to prevent, combat or alleviate the effects of an emergency; (iii) authorize any qualified person to render aid of a type that the person is qualified to provide; (iv) control or prohibit travel to or from any area of the municipality; (v) provide for the restoration of essential facilities and the distribution of essential supplies; (vi) provide, maintain and co-ordinate emergency medical, welfare and other essential services in any part of the municipality; (vii) cause the evacuation of persons and the removal of persons or live stock and personal property from any area of the municipality that is or may be affected by an emergency and make arrangements for the adequate care and protection of those persons or live stock and of the personal property; (viii) authorize the entry into any building or on any land, without warrant, by any person when necessary for the implementation of an emergency plan; (ix) cause the demolition or removal of any trees, structures or crops if the demolition or removal is necessary in order to reach the scene of the emergency, to attempt to forestall its occurrence or to combat its progress; (x) conscript persons needed to meet an emergency; and (xi) do all acts and take all proceedings that are reasonably necessary to meet the local emergency; and (b) of an emergency declaration pursuant to section 17 and for the duration of the state of emergency, the local authority may: (i) cause any emergency plan to be put into operation; and (ii) exercise any power given to the minister pursuant to subsection 18(1) in relation to the part of the municipality affected by the declaration. 14 14 c. E-8.1 EMERGENCY PLANNING (2) Subject to the approval of the Lieutenant Governor in Council, where: (a) the local authority acquires or utilizes real or personal property pursuant to subsection (1); or (b) any real or personal property is damaged or destroyed due to an action of the local authority in preventing, combating or alleviating the effects of an emergency; the local authority shall cause compensation to be paid for the acquisition, utilization, damage or destruction. 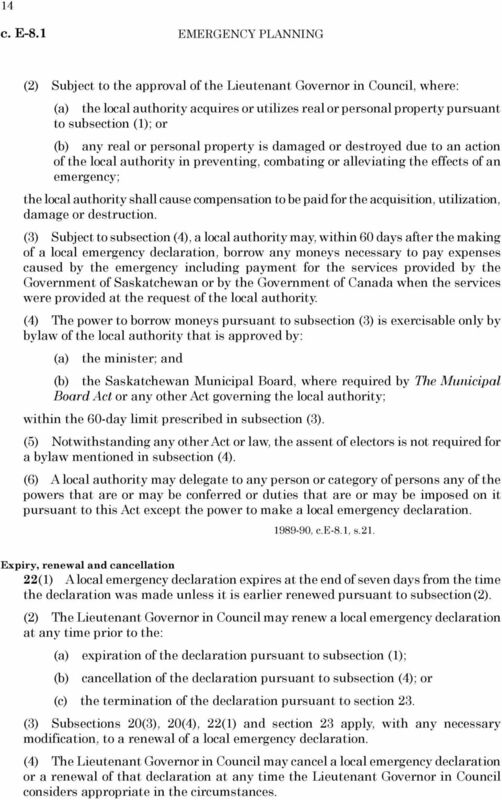 (3) Subject to subsection (4), a local authority may, within 60 days after the making of a local emergency declaration, borrow any moneys necessary to pay expenses caused by the emergency including payment for the services provided by the Government of Saskatchewan or by the Government of Canada when the services were provided at the request of the local authority. 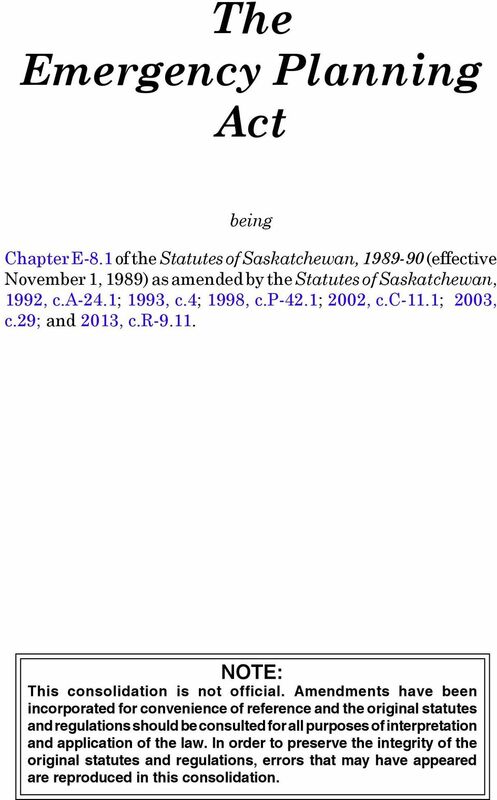 (4) The power to borrow moneys pursuant to subsection (3) is exercisable only by bylaw of the local authority that is approved by: (a) the minister; and (b) the Saskatchewan Municipal Board, where required by The Municipal Board Act or any other Act governing the local authority; within the 60-day limit prescribed in subsection (3). (5) Notwithstanding any other Act or law, the assent of electors is not required for a bylaw mentioned in subsection (4). (6) A local authority may delegate to any person or category of persons any of the powers that are or may be conferred or duties that are or may be imposed on it pursuant to this Act except the power to make a local emergency declaration , c.e-8.1, s.21. Expiry, renewal and cancellation 22(1) A local emergency declaration expires at the end of seven days from the time the declaration was made unless it is earlier renewed pursuant to subsection (2). 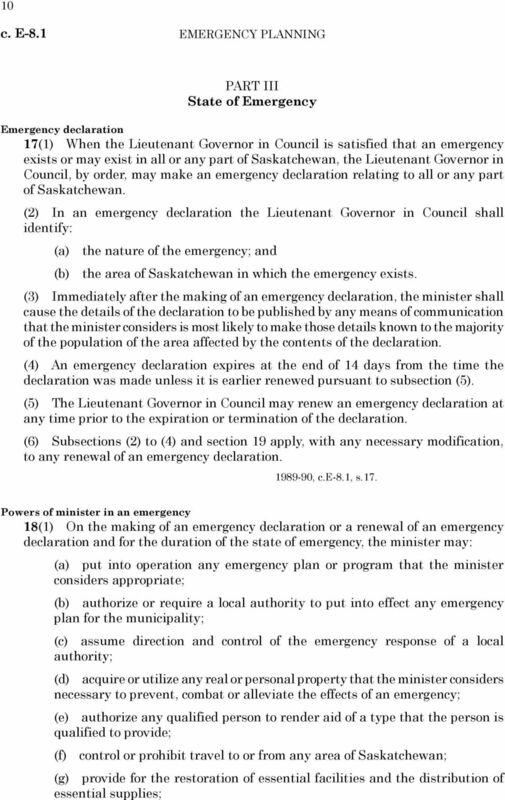 (2) The Lieutenant Governor in Council may renew a local emergency declaration at any time prior to the: (a) expiration of the declaration pursuant to subsection (1); (b) cancellation of the declaration pursuant to subsection (4); or (c) the termination of the declaration pursuant to section 23. 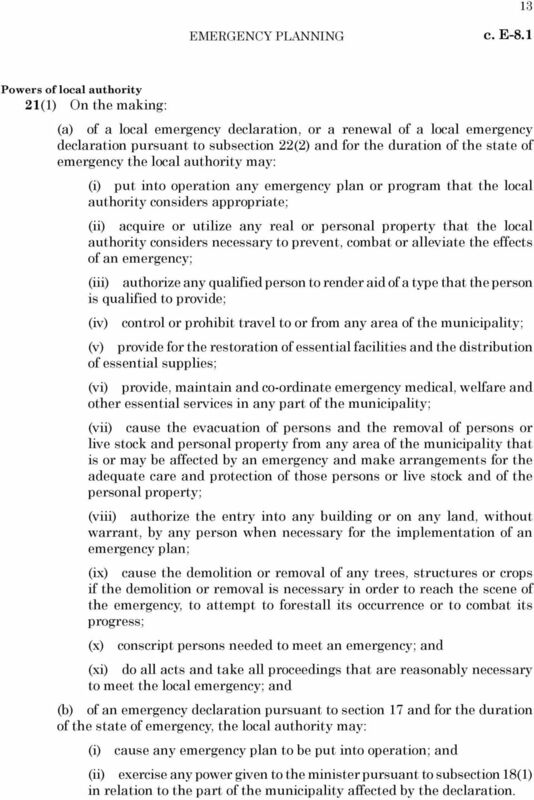 (3) Subsections 20(3), 20(4), 22(1) and section 23 apply, with any necessary modification, to a renewal of a local emergency declaration. 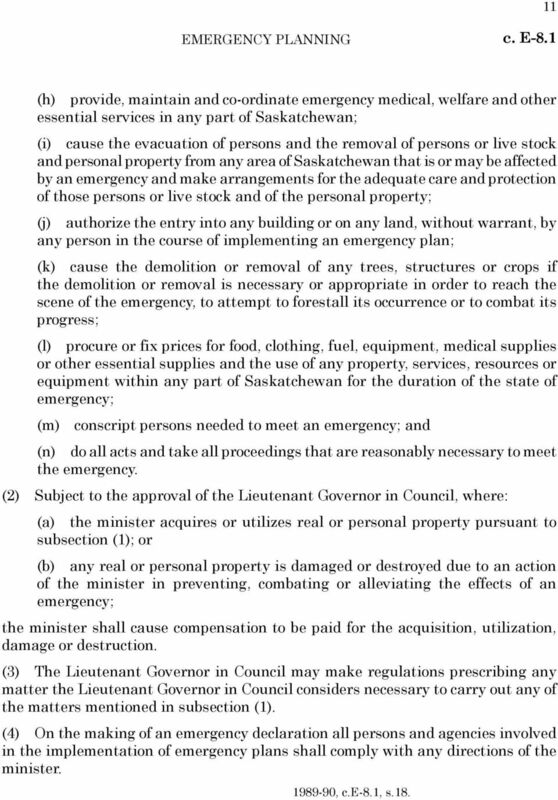 (4) The Lieutenant Governor in Council may cancel a local emergency declaration or a renewal of that declaration at any time the Lieutenant Governor in Council considers appropriate in the circumstances.